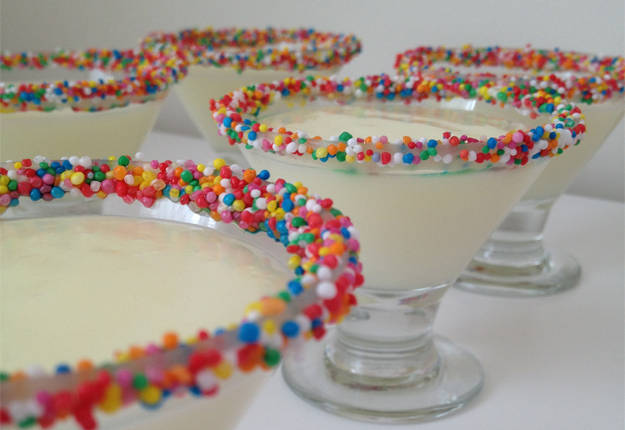 What a fun treat these Colourful Vanilla Puddings make … for young and old! Melt the chocolate and dip the rims of 8 glasses in t the chocolate. Press the rims into the 100s and 100s and place in the fridge to set. Meanwhile mix the sugar, vanilla and cornflour in a saucepan and whisk. Gradually add the milk constantly whisking so that thee are no lumps of flour. Place on medium heat and whisk until it brings to the boil. Reduce the heat to low and cook for another 3-4 minutes. So pretty, I love the pop of colour around the sides! they look so grown up, my niece would love them! So colourful and cute. Very clever idea. Thank you for sharing. If you don’t want the children have glasses or chocolate why not put some in a container suitable for them (plastic drinking cup or bowl) or and sprinkle a few hundreds & tousands on the top, no chocolate. That is provided they have no special dietary restrictions. Yum! I love anything with white chocolate, and really like the presentation of this dish! My Nieces will love these desserts! It will make them want to actually stay at the dinner table. Brilliant! What a clever and fun idea! Great for parties or any occasion. Thanks for sharing!